Václav Havel — the playwright who became an organizer who became a president — died today at age 75. The face of the Velvet Revolution in Czechoslovakia, Havel’s story expresses the power and the struggle of living on the line between art and politics. The Velvet Revolution, with its mass protests and non-violent overthrow of a totalitarian regime, resonates deeply with recent events of the Arab Spring, particularly in Tunisia and Egypt. Like in Egypt, much of the organizing was led by students, though in Czechoslovakia art students played a noted leading role, with students from the Academy of Performing Arts in Prague making the initial call for a strike that eventually spread across the country. With the communist government in control of mass media outlets, theaters became a central space for open discussion and action. Theater workers went on strike, and the Civic Forum worked out of the Theatre Without a Balustrade, dancers and actors taking on the roles of actual revolutionaries. And as the face of this movement, a playwright: Vaclav Havel. As totalitarian regimes so often do, the Czech communist government silenced artists whose ideas could be a danger to their control. Havel was banned from doing theater. 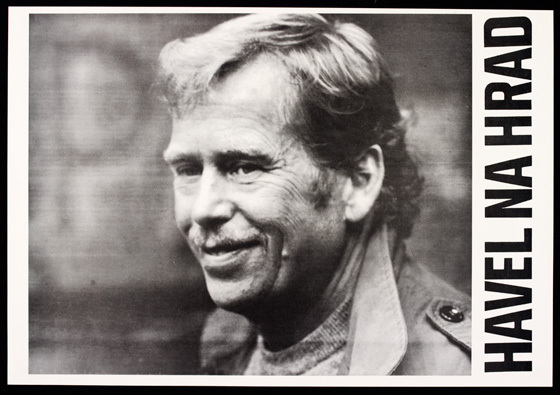 Already famous for his absurdist plays such as The Garden Party, Havel soon turned his absurdist eye to the dehumanization of the oppressive communist regime, and his work continued to be read and performed underground. In and out of prison, Havel eventually emerged as a leader of the revolution. After the revolution, Havel brought a theatricality to his roles as President of Czechoslovakia and later the Czech Republic. When he was first installed in the castle as President of Czechoslovakia, Havel brought in a set designer and costume designer to light up the castle at night and to refit the guards, while he lined the walls with modern art. At the same time, he struggled to integrate his perspectives with the everyday practicalities of formal politics. I am no Havel scholar, and will refrain from analyzing his successes and failures as a politician. But I honor his life and the way art and politics are woven through it almost seamlessly, reminding us of their deep, natural relationships. His work and that of his compatriots reminds us how theater can be both a metaphoric and a literal space — with both emotional and concrete resources — for discussion, dissent, and revolution.